Okayama is not only a major Shinkansen station, but also a gateway to Shikoku Island, which can be reached by train crossing the Seto Inland Sea Bridge . The city itself is famous mainly for Kenrokuen, a Japanese landscape garden. This is an island you should not miss, a unique combination of art resort, traditional town and industrial development. It is home to world-class modern Japanese architecture. An island famous for a industrial waste scandal might not be what you look for on a holiday! However, it tells an important story about environmental issues in the Seto Inland Sea and how residents address them, and it is still a beautiful island. Dedicated to the deity of the sea, this famous shrine in a serene forest at the top of 785 stairs is a must for anybody who loves the sea - and the mountains. From Okayama station, take the JR Uno-line to Uno (1 hour). Some trains are direct, otherwise you have to take the Marine Liner train in direction of Shikoku and change at Chayamachi . Direct buses are more frequent: twice per hour from platform 8 at Okayama Station Bus Terminal. Take an express bus in direction of Tamano and get off at Uno Station (about 1 hour). Uno Port is right in front of the station. Take the ferry to Naoshima Miyaura Port (20 min., 13 boats per day) or Naoshima Honmura Port (5 boats per day). On the island: loop bus for 100 Yen about once per hour. Rental cycles available at the Benesse Resort and at the harbour. Naoshima is probably one of the most curious islands in the Seto Inland Sea. Its Northern half houses a huge industrial complex, whereas the Southern half forms an art resort with museums, art projects, resort hotels and beaches. The industrial heritage began with a copper refinery, which has left the surrounding slopes without much vegetation cover as the soils were heavily polluted. Nowadays, the company includes a modern facility to process industrial waste. In the Southern part, which is partly designated as National Park, you can discover masterworks of modern Japanese architecture, but also art blending with traditional houses and with nature. Art and Architecture: Benesse House forms the core of the resort area, a blend of modern art museum and hotel designed by the famous architect Tadao Ando. 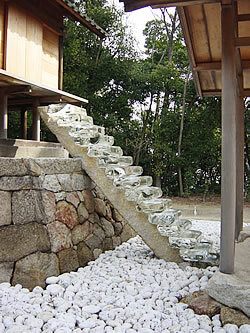 Ie (=house) Project consists of four art projects situated in the traditional center of Naoshima, the Honmura district. Chichu Art Museum is the newest addition, a museum build into the hillside to not disturb the landscape. See Benesse HP for details. Many public buildings like the town hall were designed by another famous architect, Kazuhiro Ishii, giving proof of the wealth the town accumulated due to the industrial complex it houses. Cycling: riding around the island by bicycle is the best way to discover all its attractions. It is possible to rent cycles at the port or at the Benesse Resort. Marine leisure: there are many beaches with clear water inside the resort area. The area is also ideal for kayaking. Benesse House is a high class resort hotel complex designed by the famous architect Tadao Ando. It is one of these places were you dream of staying once in a lifetime. Accommodation is available in different buildings, called the Museum, Oval, Park and Beach, with varying prices and facilities. Oyaji no umi is a small, cheap, cosy minshuku in the middle of the traditional district of Honmura. Rooms are separated by sliding doors, so don’t expect much privacy, but friendliness makes up for it! By ferry from Uno Port (see above) (40 min, 8 boats per day). Take the boat for Shodoshima . Make sure not to take the boat to Naoshima. Teshima is an island for those who are interested in environmental issues. It was the stage of one of the biggest industrial waste scandals, where almost 600.000 tons of waste were accumulated illegally until the early 1990s. Teshima Residents took Kagawa Prefecture to court over the waste scandal and made the prefecture take responsibility for correctly processing and clearing the waste from the island. Since 2003, the waste has been transported to nearby Naoshima and processed in one of the most modern facilities in the country. The residents group offers guided tours of the site and of the island in Japanese. Take the Marine Liner train on the JR Seto Ohashi line (1 hour). From Kotohira station, it is about 15 min. walk to the beginning of the long stairway that leads up to the main hall. Traveling by train over the Seto Ohashi Bridge, the first bridge to link Honshu and Shikoku in 1988, offers you good views of the sea beyond. In Kotohira, the town's homepage gives you all the necessary information to walk around town. Don't give up on the stairs to the main hall - there is plenty to see on the way, and the view from the top is impressive! Also try to get a glimpse of the new shrine office to the left if you are facing the main hall - it was built partly underground to keep the impact on the landscape as small as possible. Large iron plates were used to symbolize a ship. If you have time for a longer stroll, keep on going to Okuno-in , the inner sanctuary. Kotohira is an ideal base to start exploring Shikoku, e.g. continue to Matsuyama. there are about 20 ryokan in town, many of them with onsen facilities.